Educated at Oxford University, where he studied Modern History and Economics, before being elected to Parliament, Philip spent most of his career as an industry research analyst examining the performance of water, gas and electricity companies across the UK. Philip served over eight years in the Territorial Army, latterly as a paratrooper. In 1984, Philip spent eight months working as a volunteer teaching assistant with a Baptist Mission in Honduras, Central America. 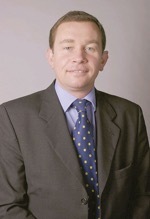 Philip was elected as Member of Parliament for the Kettering constituency in 2005, 2010 and 2015. Philip deals personally with each and every enquiry made by local people of their MP. Since being elected, Philip has one of the best combined speaking and voting records in the House of Commons of any MP, as well as the lowest expenses. His aim is to stand up and speak out on behalf of local people. “As the local MP, my job is to be the voice of local people at Westminster, not Westminster’s voice in Kettering,” Philip says. “My task is to stand up and speak out for the Kettering Constituency”. Philip also arranges visits for local people to see the Houses of Parliament and hundreds of local residents have taken advantage of this. Philip is a member of the cross-party Better Off Out group of MPs campaigning to leave the European Union.